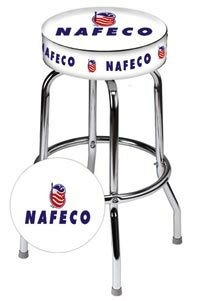 Premium quality swivel bar/counter stool, 30” H, available with your department, company, organization logo faithfully reproduced on durable 12 gauge vinyl seat with complimenting copy on the side band. Heavy gauge tubular chrome steel legs and ring. One year unconditional warranty. Made in the USA. 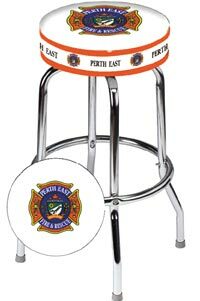 All images on this page are the property of Firehousedecals.com and any unauthorized use or reproduction of these images is strictly prohibited.